Can making your bed each day change your life? Most of us have friends that are organized and neat and make a habit of tidying up. There’s also a good chance we have friends who rarely make their beds, believing their time is better used in other ways, like digging through a pile of clothes buried in the closet, looking for the shirt that’s only been worn once. To get a sense of how Americans view the issue, we surveyed a cross-section of 1,000 people, half of whom make their beds and another half that skips the routine. Surround yourself with your favorite pillows, plop back on your comfy mattress and learn how making the bed can impact your life. Regardless of what time you wake up or retire each day, almost three-quarters of respondents that make their bed daily feel a sense of accomplishment. Only half of the non-makers said the same. The sense of accomplishing the day’s initial task strikes a chord with 82 percent of those that maintained completing a small morning task such as making the bed helped them feel more productive throughout the day. In fact, an overwhelming majority of bed-makers, 92 percent to be exact, feel so strongly about their habit that they recommend others also develop the habit. Lots of people struggle with time management and productivity issues. Family and work pressures, combined with demanding schedules that leave little free time can take a toll on anyone. However, those that make their beds say they handle these issues better. Do you notice the same co-workers seem to stray into work late most mornings, struggling to carry their belongings and looking a little disheveled? If our survey results are any indication, they may fall into the “non-maker” category when it comes to bed making. Just over half of non-makers say they take their time before getting started at work. But just shy of two-thirds of the bed-makers report they begin working as soon as they get to work. Maybe adding a question about bed-making habits on the company’s online employment application page isn’t a bad idea. 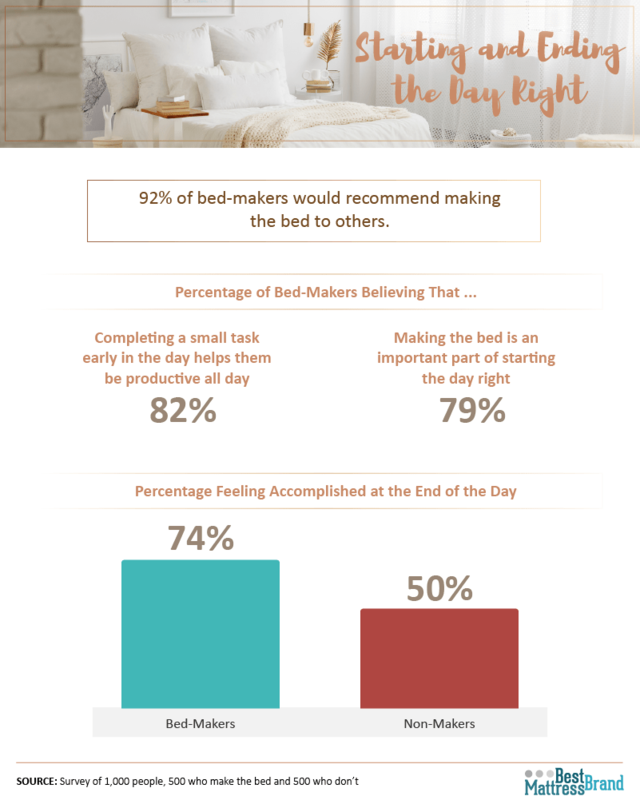 When it comes to being “very productive” and “productive,” 92 percent of bed-makers surveyed felt their work fell into one of these two categories, compared to only 84 percent of non-makers. Along with productivity output, an additional eight percent of bed-makers believed the quality of their work was higher than did non-makers. The data also revealed some interesting insights regarding work quality. Compared to non-makers, those who made their bed were more likely to complete a task to their best of their ability even when a lower standard would be acceptable. It makes sense that when people take time to make up their bed each day, they probably prefer a certain degree of order and structure in their daily routine. It came as no surprise that over 80 percent of the bed-makers report following routines and schedules. You don’t have to look far in most work environments to spot the most organized employees. You know, the ones who are rarely without their planning journal or regularly checking their smartphone or tablet for notifications on the next client video conference. Chances are, they’re part of the 72 percent of bed-makers that like to organize and plan. Besides keeping their life somewhat organized and tidy, those who routinely made their beds also seemed to have healthier habits. For example, bed-makers were eight percent more likely to maintain regular dental appointments and 15 percent more likely to eat healthier foods. Plus, they were 17 percent more likely to engage in healthy recreation. 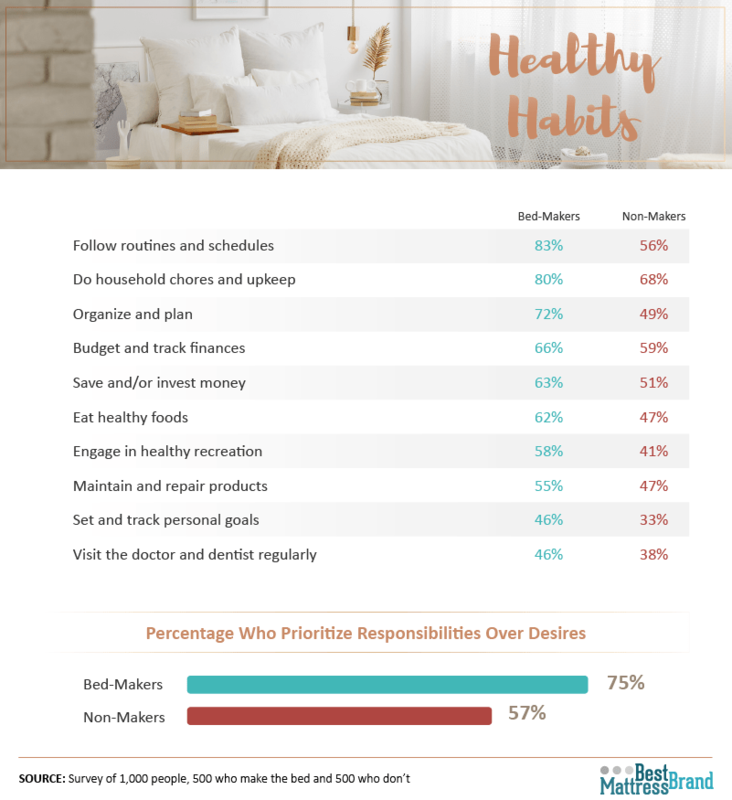 In addition to making their to-do list, two-thirds of bed-makers say they stay on top of their budget and personal finance issues, and a whopping 80 percent do household chores and upkeep around the home. The bottom line can be summed up with our finding that three-fourths of the bed-making group say they prioritize their responsibilities over their desires. When you stop by unannounced at a friend or co-worker’s home and see a clean and organized living area, chances are if you venture back to their bedroom you’ll find a bed that’s made-up too. Yes, those who routinely make their beds are cleaner, tidier, and more productive around the house. 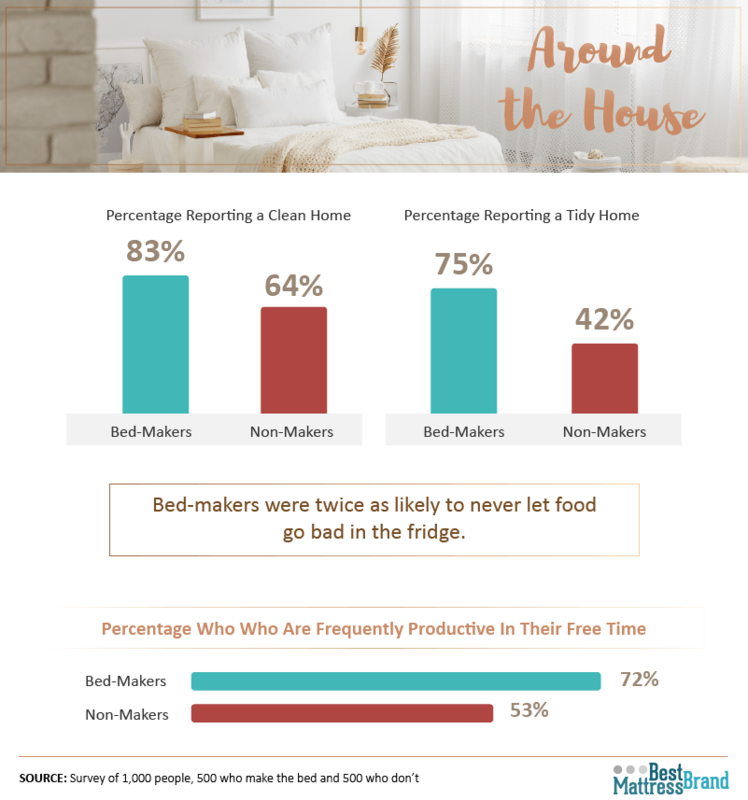 Over four-fifths of bed-makers in this survey report having a clean home, compared to less than two-thirds of non-makers. Few things are worse than using a bathroom where the toilet looks like it’s never felt the impact of a deep clean. However, those that don’t make their beds are four times more likely to rarely or never clean their toilets. This same group typically puts off washing dirty dishes for two or more days as well. While the boss appreciates the fact most of their bed-making employees appear to find more satisfaction at work, our survey found 72 percent of this group seemed more productive with their free time as well. Whether that’s getting better results at the gym or merely enjoying more time with family and friends, taking a few moments each morning to pull the sheets up and make sure the comforter or bedspread is neatly in place just might improve your business and social life. Is it possible that people who sleep better tend to make their beds more or does making the bed each day help you sleep better? The Centers for Disease Control and Prevention recommends adult get at least seven hours of sleep per night. That number increases for those over 60-years old and especially for teens and school-age children that are still growing. But what does that have to do with making your bed? It just so happens that bed-makers report averaging around seven and a half hours of sleep each night, while non-makers fall short of the seven-hour mark. On the surface, it may not seem like a big deal, but over seven days, that amounts to an extra two hours and thirty-four minutes of snooze time. Plus, bed-makers have less difficulty falling asleep and wake up feeling rested more frequently. Speaking of snoozing; hitting that button when your morning alarm grabs you from a sound slumber is relatively common for slightly less than half of non-bedmakers. However, only 35 percent of bed-makers hit the snooze button. Others prefer a slower transition, possibly thinking of the day’s to-do list or scanning the morning’s news headlines before exiting the comfort of a cozy bed. One area bed-makers were evenly split is getting out of bed immediately after waking up or staying for a few extra minutes. 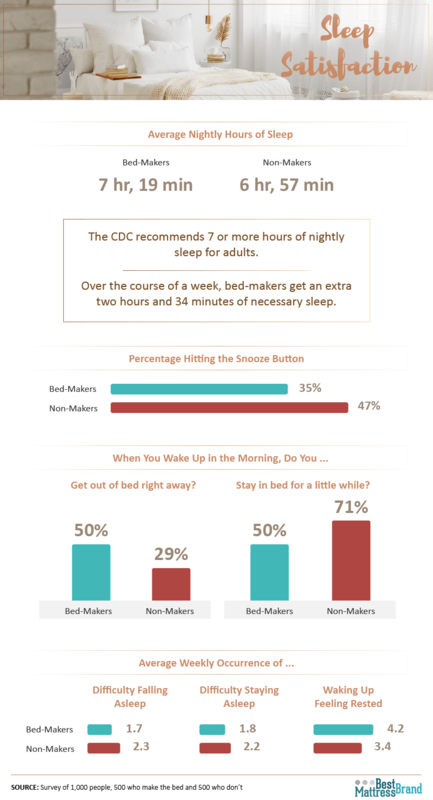 But, an overwhelming majority of non-makers we surveyed reported staying in bed longer. At Best Mattress Brand, we care deeply about everyone getting the best quality sleep possible. That’s why we help people find their perfect mattress and the great night of sleep they need. This study surveyed 1,000 people total, 500 who made the bed and 500 who didn’t. To ensure we only included results from respondents who took our survey seriously, only individuals who passed an attention check were included in the data. Our respondents ranged in age from 19 to 81 with an average age of 36. In some cases, questions and responses have been rephrased or condensed for clarity or brevity. All percentages may not add up to 100 percent; this is typically due to rounding and occasionally due to responses of “uncertain, neutral, and not applicable,” among others, not being included in the visualizations. These data are intended to be used for entertainment only. These data rely on self-reporting, and no statistical testing has been performed on the findings. If you believe your readers will find this survey of interest, as long as it’s for non-commercial purposes, we’re more than happy for you to share the results. Our only request is to provide a link to this article so readers can decide for themselves if making up the bed is the best way to begin the day.